In 1912 Victor Franz Hess made the revolutionary discovery that ionizing radiation is incident upon the Earth from outer space. He showed with ground-based and balloon-borne detectors that the intensity of the radiation did not change significantly between day and night. Consequently, the sun could not be regarded as the sources of this radiation and the question of its origin remained unanswered. Today, almost one hundred years later the question of the origin of the cosmic radiation still remains a mystery. Hess' discovery has given an enormous impetus to large areas of science, in particular to physics, and has played a major role in the formation of our current understanding of universal evolution. For example, the development of new fields of research such as elementary particle physics, modern astrophysics and cosmology are direct consequences of this discovery. Over the years the field of cosmic ray research has evolved in various directions: Firstly, the field of particle physics that was initiated by the discovery of many so-called elementary particles in the cosmic radiation. There is a strong trend from the accelerator physics community to reenter the field of cosmic ray physics, now under the name of astroparticle physics. Secondly, an important branch of cosmic ray physics that has rapidly evolved in conjunction with space exploration concerns the low energy portion of the cosmic ray spectrum. Thirdly, the branch of research that is concerned with the origin, acceleration and propagation of the cosmic radiation represents a great challenge for astrophysics, astronomy and cosmology. Presently very popular fields of research have rapidly evolved, such as high-energy gamma ray and neutrino astronomy. In addition, high-energy neutrino astronomy may soon initiate as a likely spin-off neutrino tomography of the Earth and thus open a unique new branch of geophysical research of the interior of the Earth. Finally, of considerable interest are the biological and medical aspects of the cosmic radiation because of it ionizing character and the inevitable irradiation to which we are exposed. 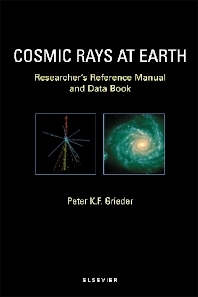 This book is a reference manual for researchers and students of cosmic ray physics and associated fields and phenomena. It is not intended to be a tutorial. However, the book contains an adequate amount of background materials that its content should be useful to a broad community of scientists and professionals. The present book contains chiefly a data collection in compact form that covers the cosmic radiation in the vicinity of the Earth, in the Earth's atmosphere, at sea level and underground. Included are predominantly experimental but also theoretical data. In addition the book contains related data, definitions and important relations. The aim of this book is to offer the reader in a single volume a readily available comprehensive set of data that will save him the need of frequent time consuming literature searches. Preface. Comments for reader. Acknowledgements. Cosmic ray properties, relations and definitions. Cosmic rays in the atmosphere. Cosmic rays at sea level. Cosmic rays underground, underwater and under ice. Professor Peter Grieder obtained his MS degree in physics from the Illinois Institute of Technology in Chicago in 1957; he did the research for his thesis with the Argonne group at the University of Chicago. In 1961 he received a PhD in high energy cosmic ray physics from the University of Bern. He then worked successfully at the Niels Bohr Institute of Copenhagen, at CERN in Geneva, the University of Bern, and as a visiting professor at the Institute for Nuclear Studies of the University of Tokyo. In 1968 he was appointed lecturer at the University of Bern and in 1978 professor of physics. From 1985 to 1987 he was secretary of the Swiss Physical Society. His research activities comprise high energy phenomena, extensive air showers and neutrino astronomy. He is the author of numerous scientific articles.